These batteries feature low maintenance and valve regulated construction combined with heavy-duty plates and unique separator systems to deliver cyclic capability twice as long as conventional batteries, providing constant high quality and performance. 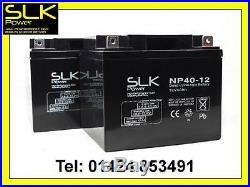 · 12 Volt 40Ah Deep Cycle Cyclic batteries - (Pair Supplied). · Brand New Fresh Stock for Maximum Performance. · Superior High Performance Battery Reliable and safe performance. · Pair of 12v 40Ah Mobility Scooter Batteries. · Each Battery = Voltage = 12 Volts. · Each Battery = Battery Capacity = 40Ah. · Number of batteries supplied = 2 Batteries Supplied. · Each Battery = Length = 198mm, Width = 166mm, Height = 170mm. VIEW OUR OTHER ITEMS IN THIS RANGE. 2 x 12v 10ah Batteries. 2 x 12v 12ah Batteries. 2 x 12v 15ah Batteries. 2 x 12v 17ah Batteries. 2 x 12v 22ah Batteries. 2 x 12v 24ah Batteries. 2 x 12v 33ah Batteries. 2 x 12v 36ah Batteries. 2 x 12v 40ah Batteries. 2 x 12v 50ah Batteries. 2 x 12v 55ah Batteries. 2 x 12v 75ah Batteries. The item "2 x 12v 40AH SLK POWER MOBILITY SCOOTER WHEELCHAIR BATTERIES AS. 42AH 44AH 45AH" is in sale since Monday, May 5, 2014. This item is in the category "Health & Beauty\Medical & Mobility\Mobility/Walking Equipment\Mobility Scooters". The seller is "slkmobility" and is located in Pevensey. This item can be shipped worldwide.